Here are some great book lover designs that are available on a variety of shirts, book bags, mugs, hats, and LOTS of other great gift items! Click on the design to see the items available. 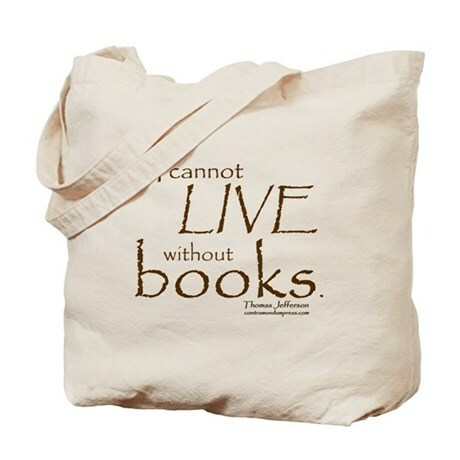 Click here to see MANY, MANY, more Book Lover gift ideas at CafePress! Be a thrill-seeker! Read a banned book! Available on: Drinkware, T-Shirts & Clothing, Posters, Stickers & More! Available on: Drinkware, T-Shirts & Clothing, Posters, Stickers & More! "So Many Book, So Little Time"
Available on: Buttons, T-Shirts & Clothing, Book Bags and more! Makes a great gift for fellow book club members. Books! I need More Books! This Literary Diva gift is great for English teachers, librarians or published authors! 100% cotton. Distressed, softened print. Purchase of this shirt sends one book to a community in need. Click Here to see the whole collection of Book Cover Art T-shirts! Let this sweet sleeping cat remind you where you'd rather be. This graphic design is a great gift choice for book club friends! Thomas Jefferson said it best: I cannot live without books! For readers and bibliophiles everywhere. Celebrate friendship with this nature-themed double-charm pendant, fashioned in bright and darkened sterling silver. The reversible circle tag features a tree design on the front and a sentimental inscription on the back. A sterling silver chain is included. If you like this "Gifts for Readers" shop... check out "Something For Everyone" for more great gift ideas! Purchases made from this page will generate a modest commission for The Book Venue. I hope you are pleased with any items that you may purchase here. Although I am not able to help with any questions or problems regarding any transactions generated from these links, I would appreciate being contacted with any complaints so that I can remove links to unsatisfactory products or companies. Please Email me with any feedback regarding the above products.